Nick Strimple: composer, conductor, scholar, author of the critically acclaimed book 'Choral Music in the Twentieth Century' and faculty member at the University of Southern California Thornton School of Music. Zacharti Lach, premiered by the London Youth Choir conducted by Suzi Digby OBE at St. Sepulchre Without Newgate Church in London, England on 26 October 2015. Two Flowers, premiered by the Hollywood Master Chorale at the Hollywood First Lutheran Church on 9 June 2013 (concert repeated on 22 June 2013) under the direction of Lauren Buckley. Strimple is featured in this documentary. commissioned by The Golden Bridge. Scheduled for premiere 17 September 2016.
commissioned by Jo-Michael Scheibe for the USC Thornton Chamber Singers. Scheduled for premiere 21 October 2016.
commissioned by the USC Thornton University Chorus. Scheduled for premiere 30 November 2016.
commissioned for Voce by Anne Denholm, The Royal Harpist. Scheduled for premiere in December 2016.
commissioned by Jaroslav Svěcený and Václav Mácha. commissioned by the ISHA Trio. Teach Us, O Lord for two-part chrous, organ, and optional congregation, published by Pavane Publishing, 2016. God Is With Us for unison chrous, organ, and optional congregation, published by Pavane Publishing, 2016. The Mother of God for SSAA and piano, published by Pavane Publishing, 2016. In My Craft or Sullen Art for SSAA and piano, published by Pavane Publishing, 2016. Leshoni Konanta Elohai for cantor, SATB chorus, and piano, published by Pavane Publishing, 2016. Lord, You've Been Our Dwelling Place for SATB, organ, and optional congregation, published by Pavane Publishing, 2015. Daily Prayer for SATB, organ, and optional congregation, published by Pavane Publishing, 2015. Two Little Pieces on Text by Dr. Watts for SATB chorus, published by Pavane Publishing, 2015. 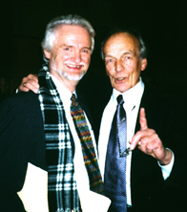 Nick Strimple and Günter Einhaus in Nuremberg, 2000. 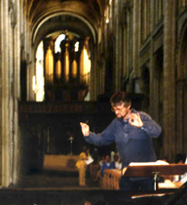 Strimple rehearsing in Norwich Cathedral, 1987.